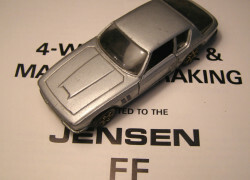 Item description: Pre-dating Dinky Toys Jensen FF number 188, was the Italian Politoy’s Art.573 ‘Jensen Coupe Vignale’. This is a second issue silver example with the later entirely plastci wheels. 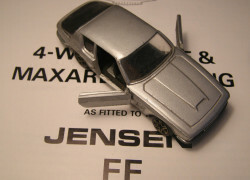 The silver model without the Politoy racing striped decal to the bonnet bulge. 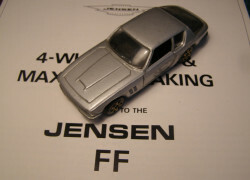 Although simply entitled the ‘Jensen Coupe Vignale’, the car the model was based on was actually the Jensen FF.